Iraq’s outgoing Prime Minister Haider al-Abadi, an American ally, and the radical Shiite cleric Moktada al-Sadr, a longtime foe of the United States, said on Saturday that they had become political allies in an effort to form a new government in the wake of widely discredited elections. 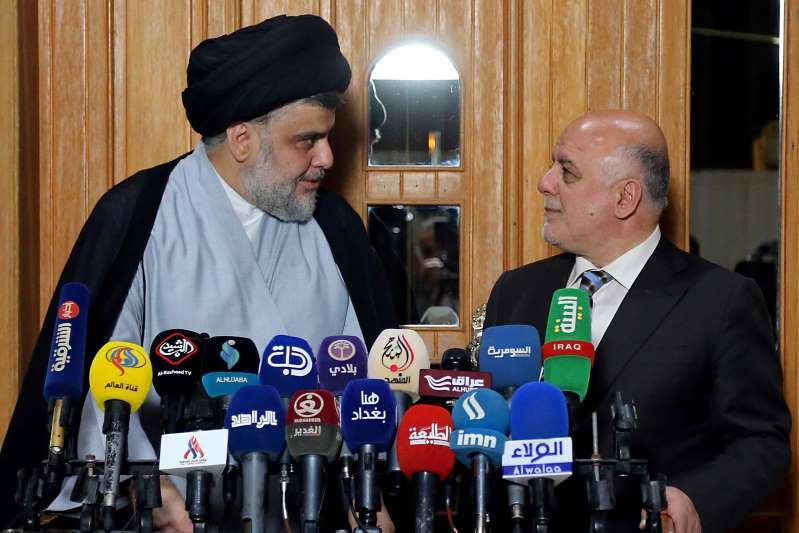 The announcement, made in the Shiite holy city of Najaf in a meeting between the two leaders, came as a surprise to many political observers, especially because Mr. Sadr — the top vote-getter — had already announced an alliance with a pro-Iranian Shiite leader, Hadi al-Ameri. Mr. Ameri was second in the polls, while Mr. Abadi was third. “This is a call for an alliance that is nonsectarian and rejects ethnic politics in order to include all of the Iraqi people,” Mr. Sadr said at a joint news conference with Mr. Abadi, who is still the prime minister until the new parliament sits on July 1 and elects his replacement. “We want to speed up the process of coming to a political agreement to send a positive message to the citizens that we are serious about moving forward,” Mr. Abadi said. Once a wanted man by the American authorities during the occupation of Iraq, Mr. Sadr, a Shiite cleric and former militia leader, has remained a critic of the Americans while at the same time distancing himself from Iran and presenting himself as a nonsectarian figure. Despite Mr. Sadr’s fiery anti-American rhetoric of the past, he has been quiet on that front since last month’s elections and in his speech in Najaf on Saturday refrained from criticizing the United States. Mr. Sadr and Mr. Abadi had long been bitter rivals. But similarly, Mr. Sadr had broken with Mr. Ameri over his close ties to Iran. Mr. Ameri is the leader of the Shiite militia movement widely credited with turning back the advance of the Islamic State in Iraq after 2014, with the help of Iranian training and American air support. Both Mr. Abadi and Mr. Sadr emphasized that their alliance did not mean the end of Mr. Sadr’s alliance with Mr. Ameri. American military officials, who still have 4,500 troops in Iraq and Syria fighting against the Islamic State, and are active in training and advising Iraqi troops, face a difficult decision in how to deal with a government dominated by Mr. Sadr and other militia leaders like Mr. Ameri, who have close ties to Tehran at a time when the Trump administration has repudiated the nuclear agreement with Iran. Mr. Sadr scored an upset victory as the leading vote-getter in the May 12 national parliamentary elections, which were marred by the lowest voter turnout since the 2003 fall of Saddam Hussein. But no party won enough seats in parliament to govern without forming alliances with several of the many parties. The results were also contested on grounds of fraud, with the outgoing parliament ordering a manual recount of the votes, a decision upheld by Iraq’s highest court. It was unclear, however, whether the new parliament would carry out that decision. It was also unclear whether the new alliance brought Iraq’s political factions any closer to a decision on who will lead the next government. In Iraq’s complex electoral terrain, none of the four major groupings among the majority Shiites appears to have enough seats, even in coalition with all other Shiite parties, to form a government and choose a new prime minister. That will mean forming a coalition with Sunni and Kurdish parties as well. In addition, one of those Shiite groupings, led by former prime minister Nuri Kamal al-Maliki, has refused to make common cause with the other Shiite groups. The election results came as a blow to Mr. Abadi, despite popularity in some quarters of Iraq for his government’s victory over the Islamic State and its success in stopping an independence bid by the country’s restive Kurdish population in the north. It was not clear whether the two leaders’ political alliance had agreed on any one candidate as their choice for prime minister. But a spokesman for Mr. Sadr said that Prime Minister Abadi did not insist on continuing as prime minister in exchange for his support. Jaafar Almosawi, Mr. Sadr’s political spokesman, said that the Sadr faction already had five people under consideration for the role of prime minister, but that issue did not come up in the alliance negotiations. “We did not talk about the next prime minister,” he said. Political analysts said the latest alliance was a movement toward bringing all of the Shiite groups together, but it also increased uncertainty about who would emerge as leader. “Two or three days ago we thought the candidate for prime minister would be Hadi al-Ameri, but now there is talk about nominating Haider al-Abadi again,” said Wathiq al-Hashimi, head of the Iraqi Strategic Studies Group, a think tank in Baghdad.